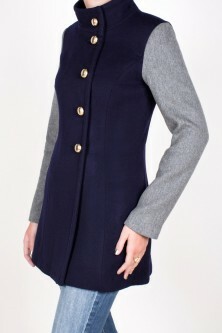 Click the button below to add the Navy and Grey Aldrich Coat to your wish list. Just in time to fend off a blustery Fall, we're introducing the Sasha Rhett Aldrich coat to protect you from the elements in colorful, military-inspired style. Designed for both casual and work settings, this two-toned wool coat will by your new outerwear staple.